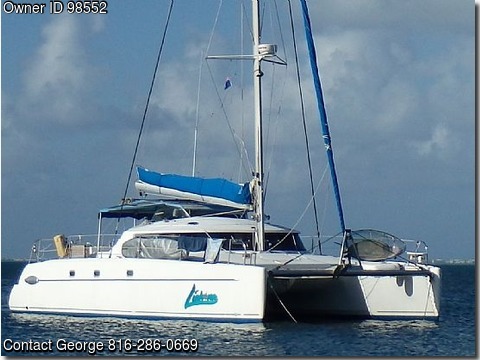 Boat is located in Ft Lauderdale,Florida.Please contact the owner @ 816-286-zero six six nine or sailingLiahona@gmail.com…2001 Fountaine Pajot Belize Maestro The Belize Maestro was designed to allow privacy and comfort for the owner. The entire starboard hull is dedicated to the Owners suite, and includes a salon area with comfortable sofa, sleeping berth with a large bed and shelving, a closet, desk area with book case, a private head, roomy shower and bathroom cabinets, and expansive storage. Two additional berths are located in the port hull, as well as a spacious head with shower. V-berths in the bow of each hull provide additional sleeping and or storage space. Above decks, the attractive circular salon and well appointed kitchen share large windows fore and aft, allowing the scenery to be enjoyed from air conditioned comfort. Double sink, with fresh and salt water pumps, microwave, three burner stove, separate refrigerator and freezer, icemaker and oven make meal preparation a pleasure. Enjoy sunsets from the cockpit, which comfortably seats 10-12 for entertaining, with table for 6. Snorkel or dive easily off stern, and rinse with freshwater shower before relaxing aboard. Cockpit cushions and sunshades provide cooler comfort in anchorages when you&#39;ve soaked up too much sun. ORIGINAL OWNER is convinced he chose the right boat for cruising around the world comfortably with guests, or with first mate. Fully equipped for offshore passages, this 2001 Fountaine Pajot has circumnavigated the globe, and enjoyed the Eastern and Western Caribbean. The boat has been well maintained and is ready for extensive cruising. Newer Yanmar 29.5 HP diesels, Generator,Inverter-Charger,Icom Single sideband, with Pacnor self-tuner, Raymarine 24&quot; Radar, Raymarine Chartplotter, Raymarine GPS,Raymarine Autopilot, AIS, Forward Facing Sonar, Remote windlass and chain counter, Watermaker,Icemaker,12 Volt Refrigerator,12 volt freezer,Solar panels, 2 AC&#39;s, (one replaced 2014), 9 ft Caribe dinghy with outboard. Spinaker, para-anchor (drogue), Spot locater, MOB system with 5 bracelets, aircraft life raft, lifejackets, rain gear, and more. Now located in Fort Lauderdale awaiting new owner ready for great adventures.